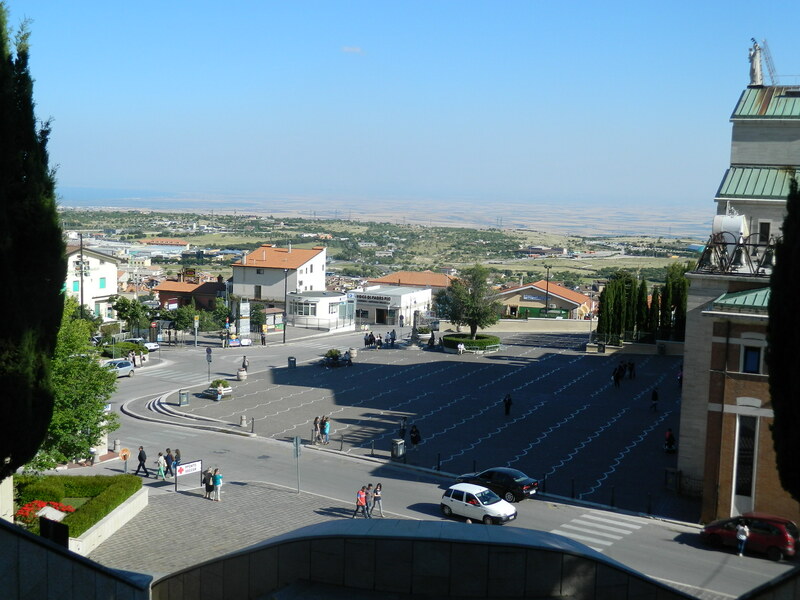 We woke up early Friday morning to catch a ride to San Giovanni Rotondo, in the Foggia province in the region of Puglia, southern Italy. 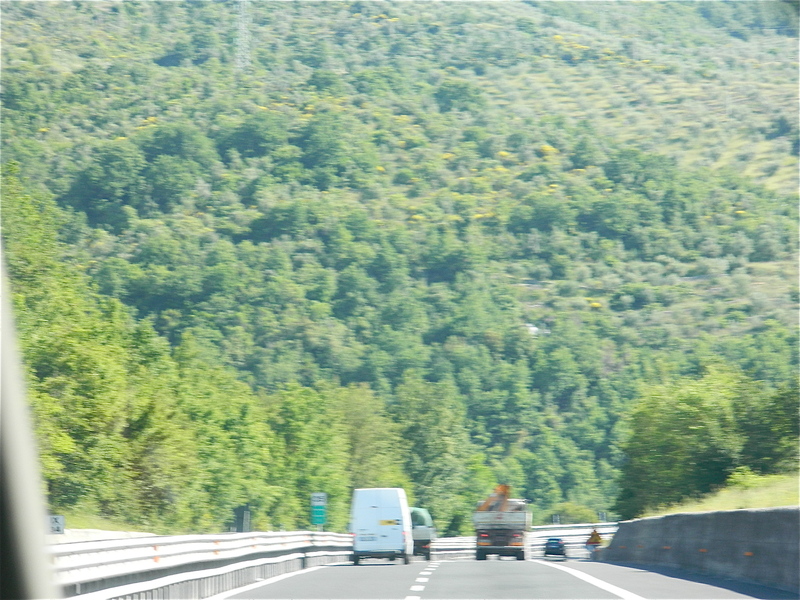 It was about a 4-5 hour drive from Rome because of heavy traffic, but once we escaped the cloggy-ness and smog of the city, we suddenly found ourselves on an empty, stretched out highway with nothing but lush greenery for miles and miles. Beauty doesn’t even begin to describe it. The farming fields along the mountains looked straight out of an Italian calendar, with rustic buildings and the occasional small village popping up out of nowhere, along with lush olive trees growing along the slopes. Was this The Sound of Music, or am I really driving through here right now? After getting off the main highway, we drove throw large yellow fields with all kinds of crops. At this point it was a bit hard to sleep because of the wind and how fast our driver was going, but I definitely took in the surroundings. 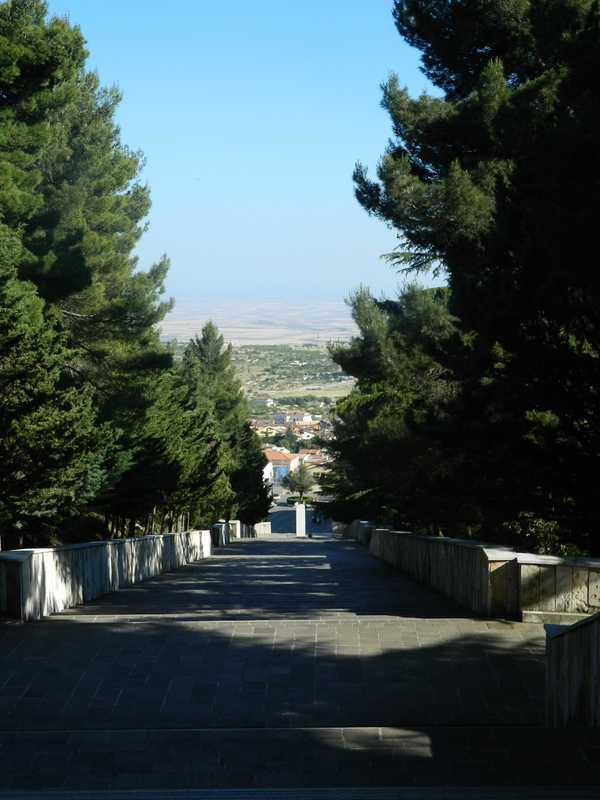 At last, we ended up at a little foothill and going up a series of smaller mountains in Apulia (Puglia region) – if you look at a map of Italy, right on the heel of the boot, bordering the Adriatic and Ionian Seas. 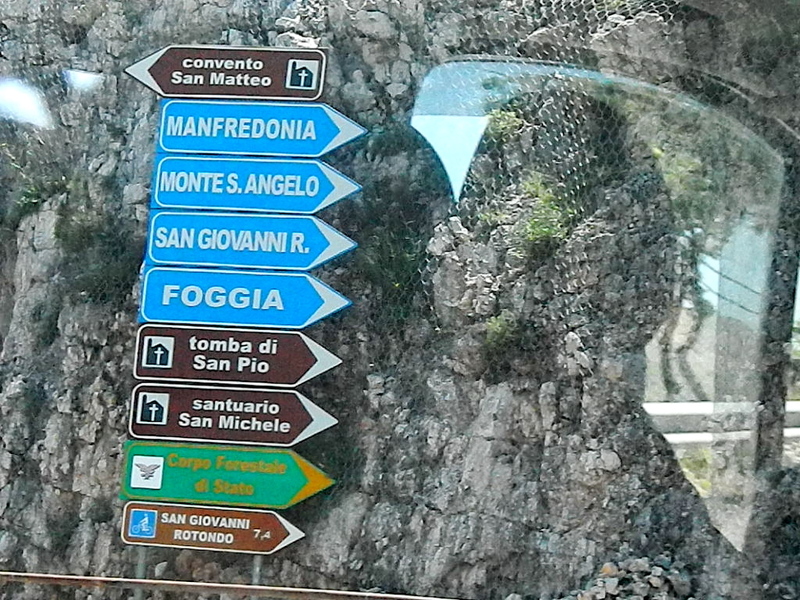 We had entered the province of Foggia, and from here it was only a few kilometers ahead. 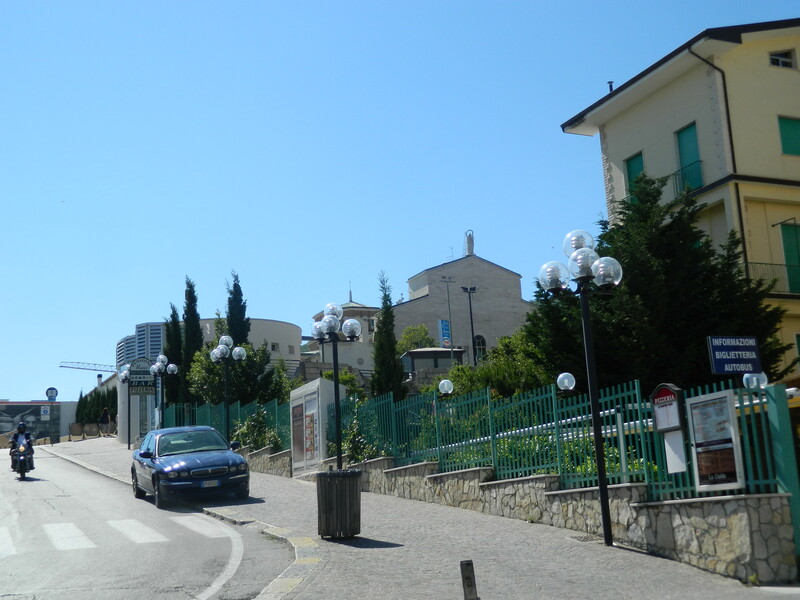 The road started going uphill as we traveled closer to San Giovanni Rotondo, the commune/religious town which lies just beyond the mountains. 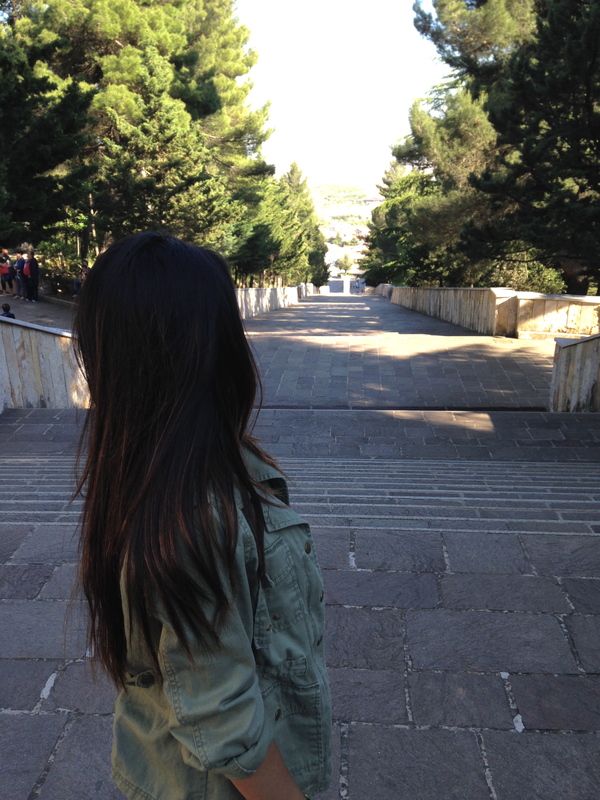 Roads turned into cobblestone streets and the familiarity of a small city, not unlike my own hometown, settled in. We had arrived. 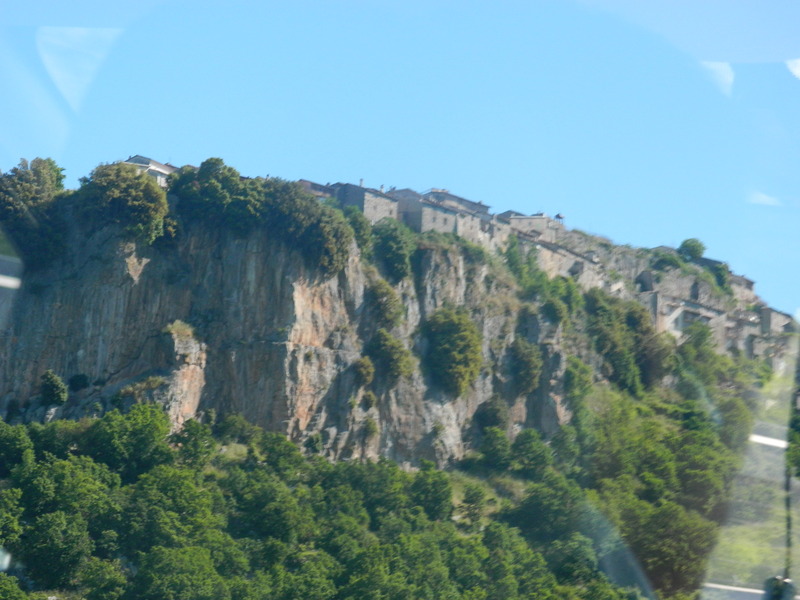 Small towns built on cliffs. 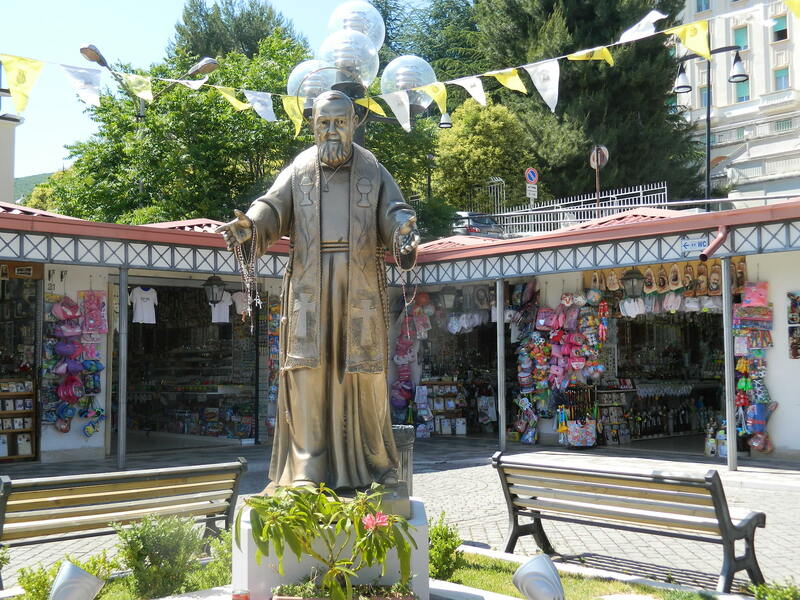 Aside from its winding roads and altitude, the first thing I noticed about SGV, being a popular religious pilgrimage spot and the home of Padre Pio, is that there are statues of him everywhere. Literally, of every size and color and pose. 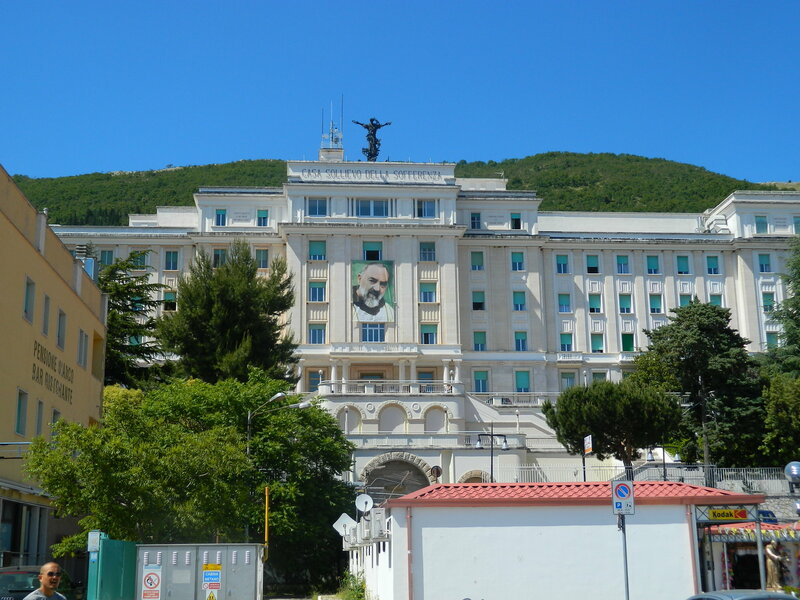 Even the local hospital, Casa Sollievo della Sofferenza (Home for the Relief of the Suffering), has a huge poster of Padre Pio hanging in the center of the whole building. 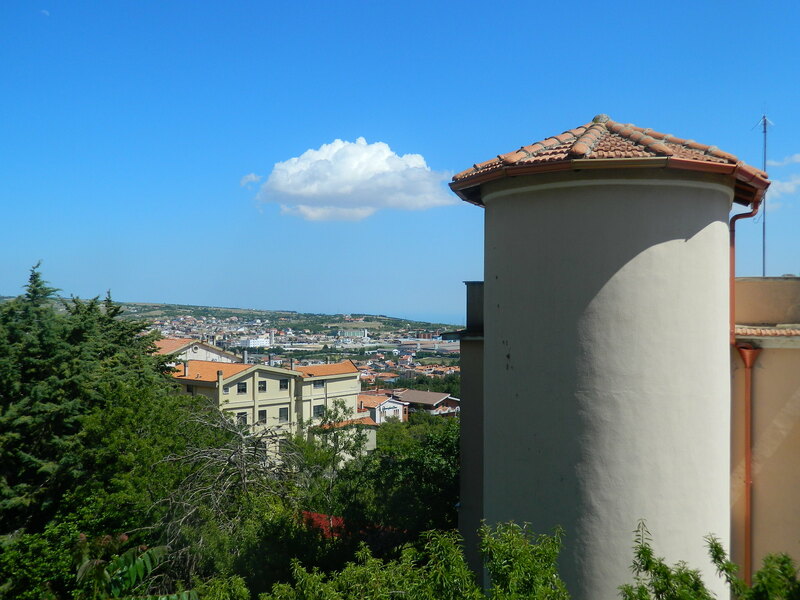 Only in a small Italian town can you completely get away with this, haha. It’s astounding how the whole community comes together for this one man, a man who lived very ordinarily in town just as they do. 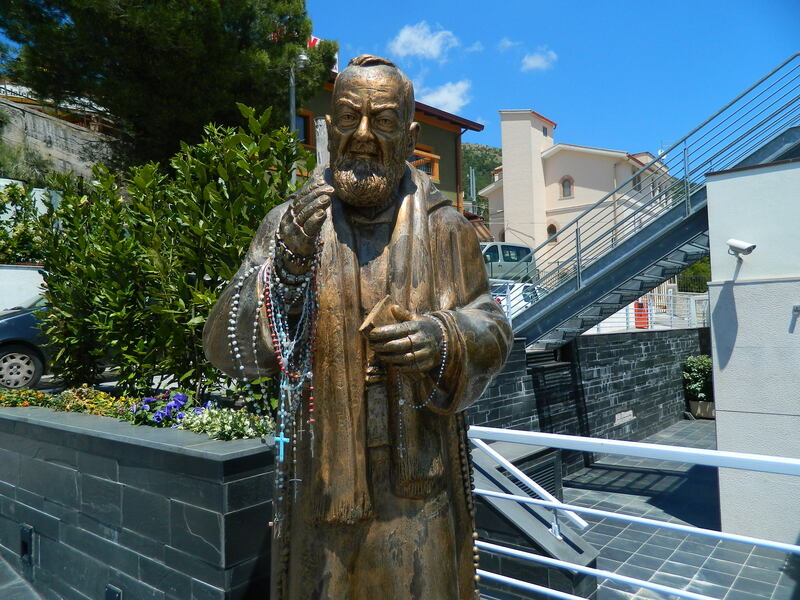 Now there are museums, churches, stores everywhere selling his rosaries and novenas and statues, and a string of hotels along the uphill narrow streets have popped up since Saint Pio’s passing. 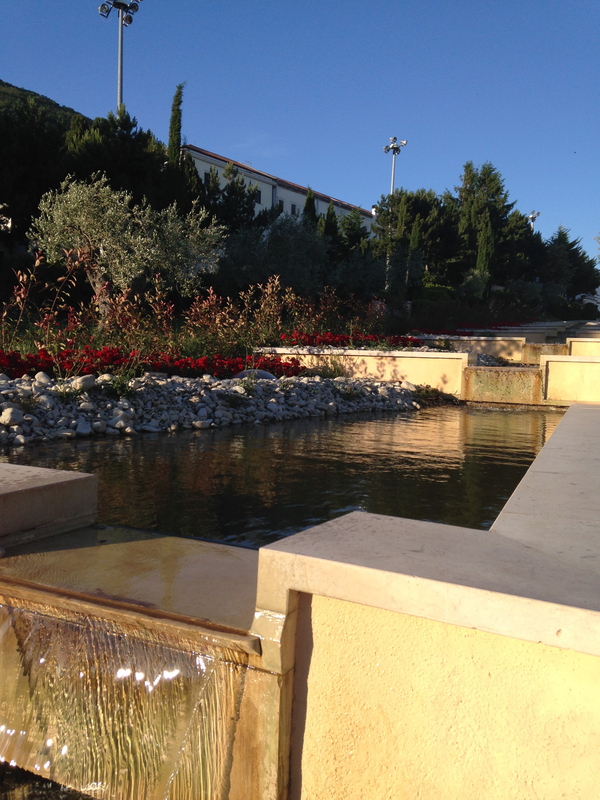 San Giovanni Rotondo is a special place, no doubt. And I was soon to find out. 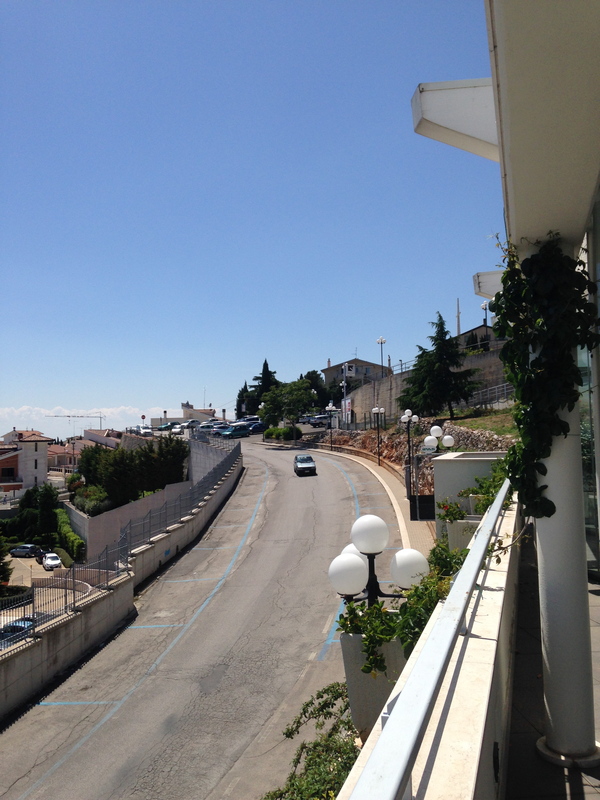 Our hotel, Hotel Vittoria. 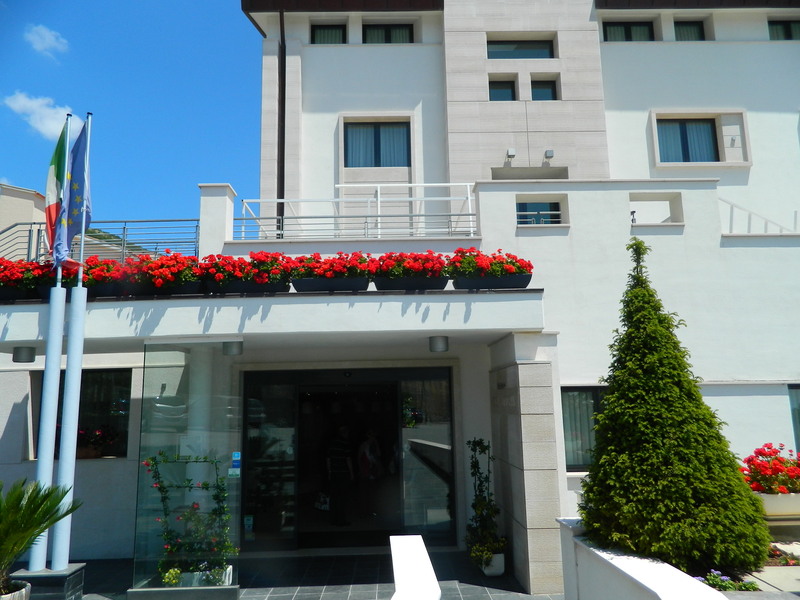 Right along the main street and walking distance from the main basilica & friary. 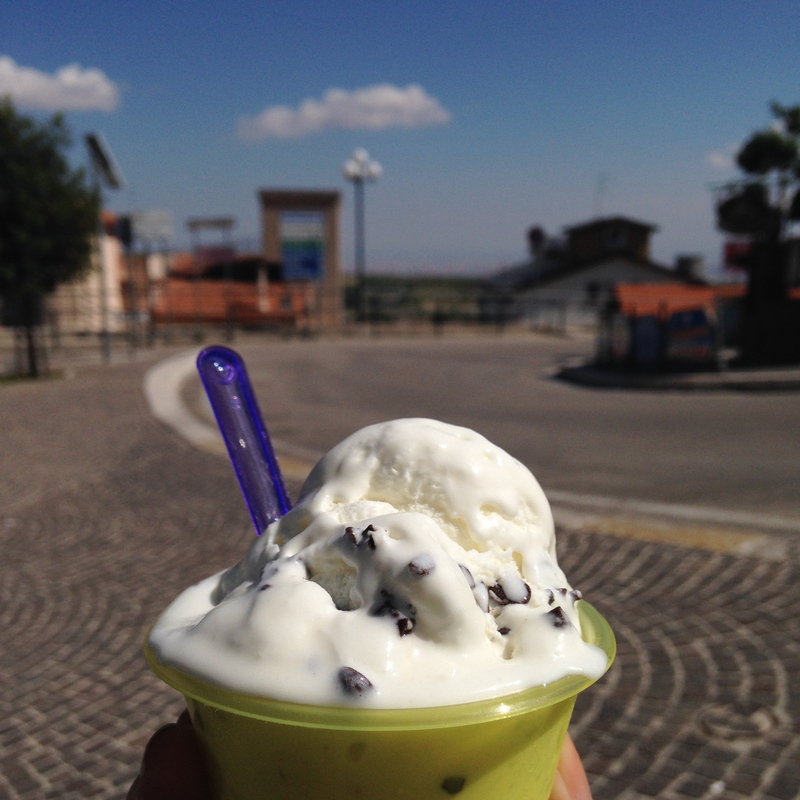 Stopped for a bite of stracciatella (chocolate chip) gelato, of course… just 1.50 Euro! 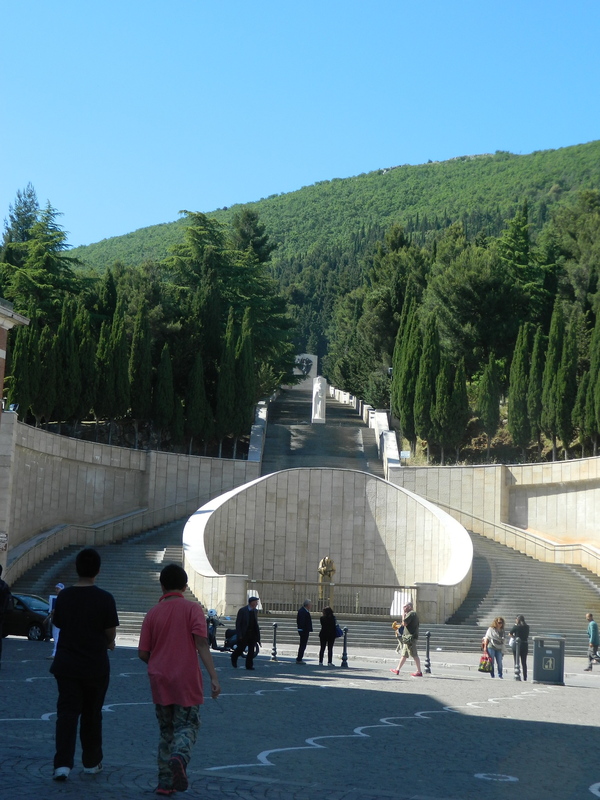 The 255-step flight of stairs that many pilgrims to San Giovanni Rotondo take, following the path of Jesus in the Stations of the Cross. 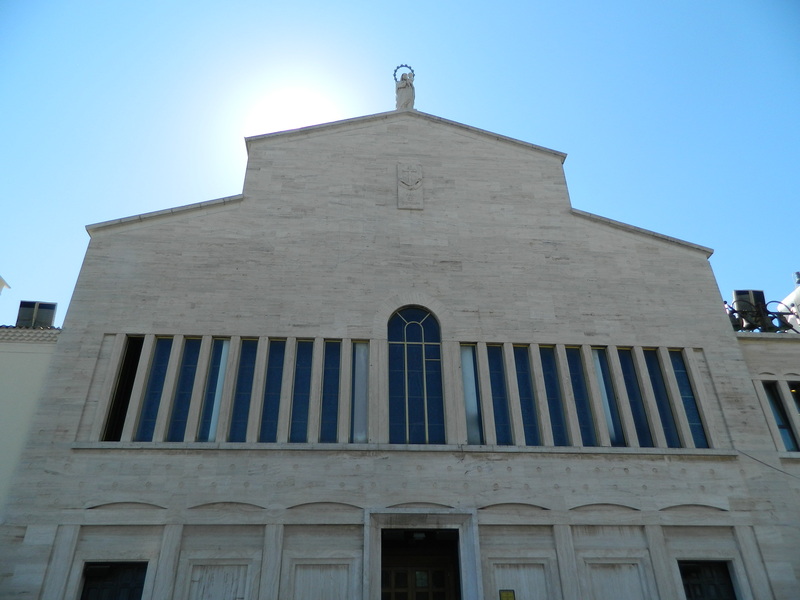 The original church of Our Lady of Grace, where the Capuchin friars including Padre Pio lived and worked and continue to hold daily masses. 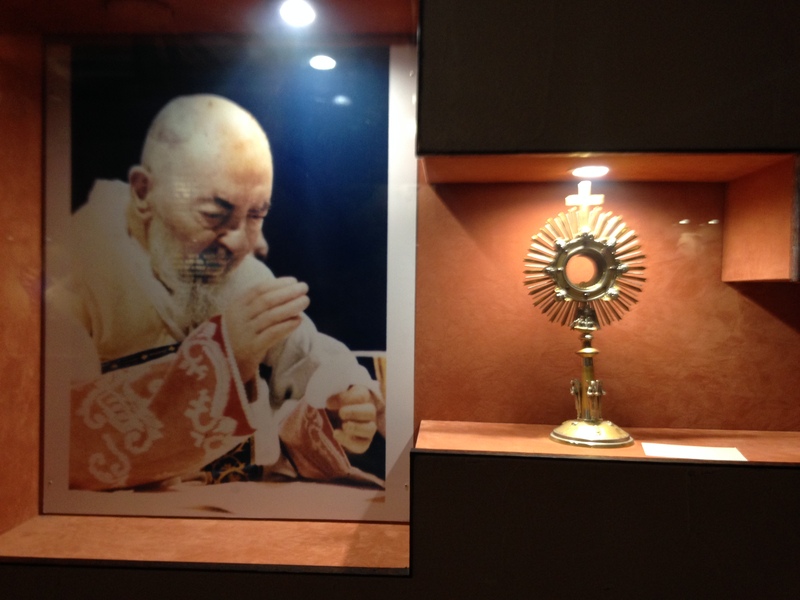 Second-class relics of Saint Padre Pio. 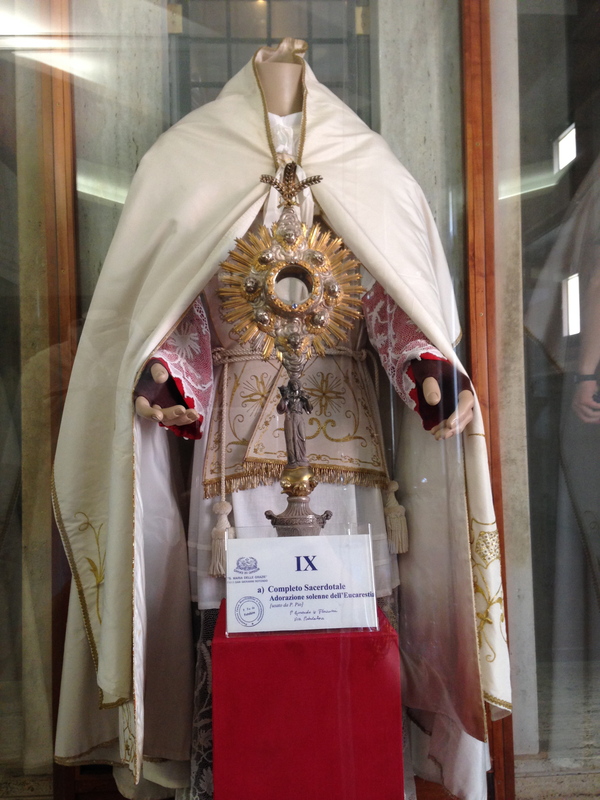 The cloth and bandages from the stigmata wounds on his hands, feet, and sides. 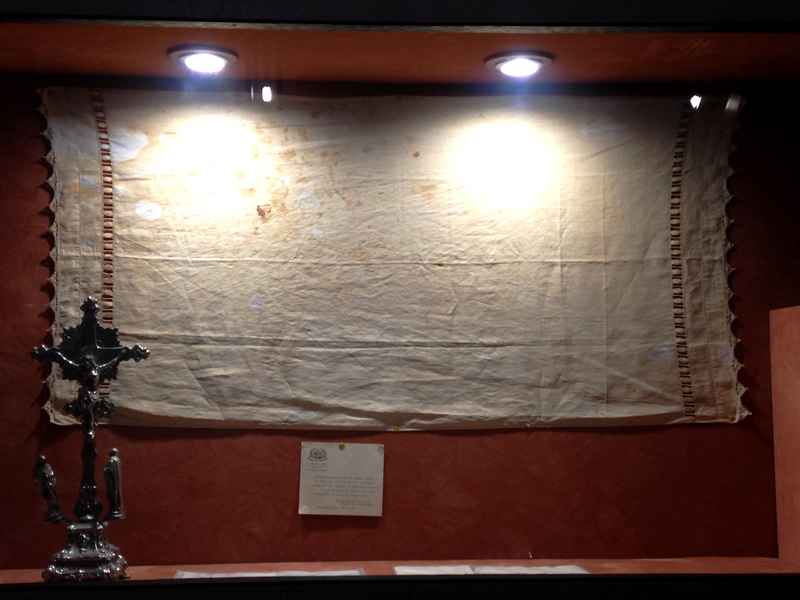 One of Pio’s bloodstained cloths. 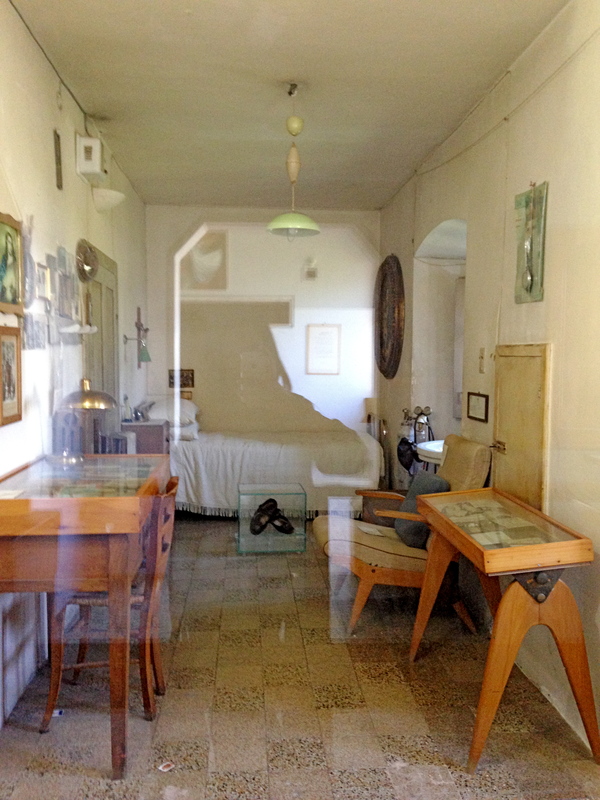 The cell (room) where Padre Pio lived, suffered the stigmata, & later died in 1968 within the Capuchin friary. 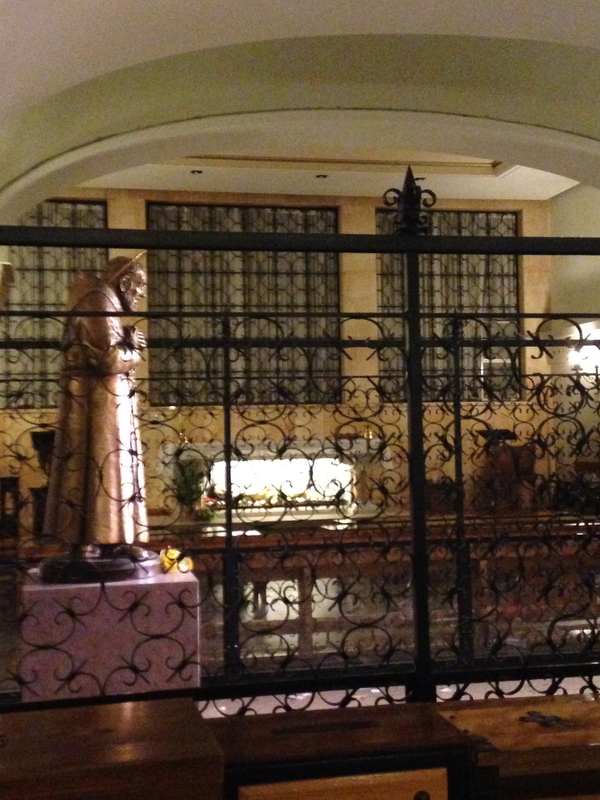 A moving painting of Pope John Paul II praying to the tomb of Padre Pio, which he visited shortly after his passing. 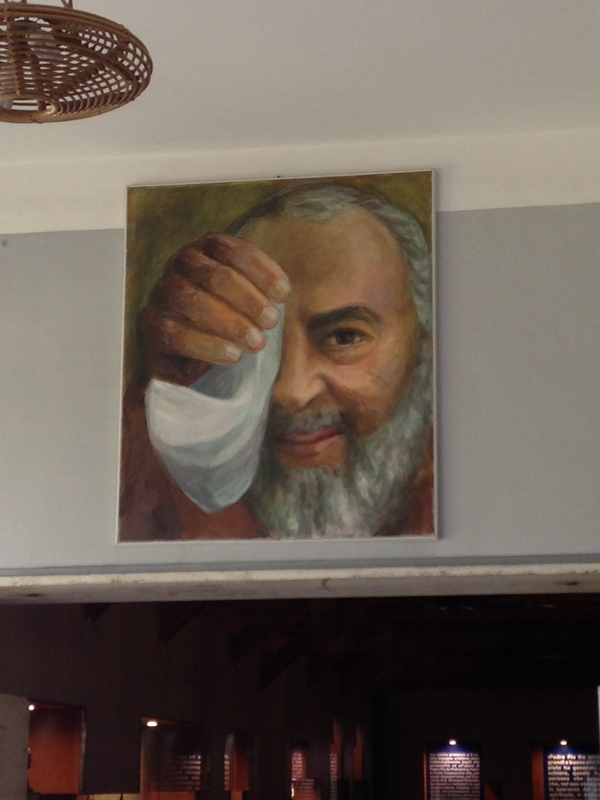 One of my favorite artworks in the museum… Padre Pio was not always in pain. He smiled too! 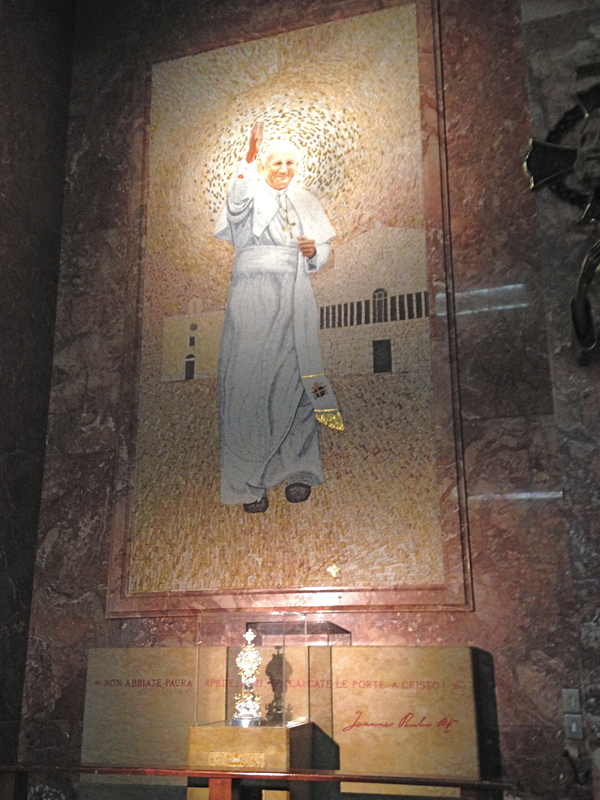 Gorgeous mosaic of Pope JPII. 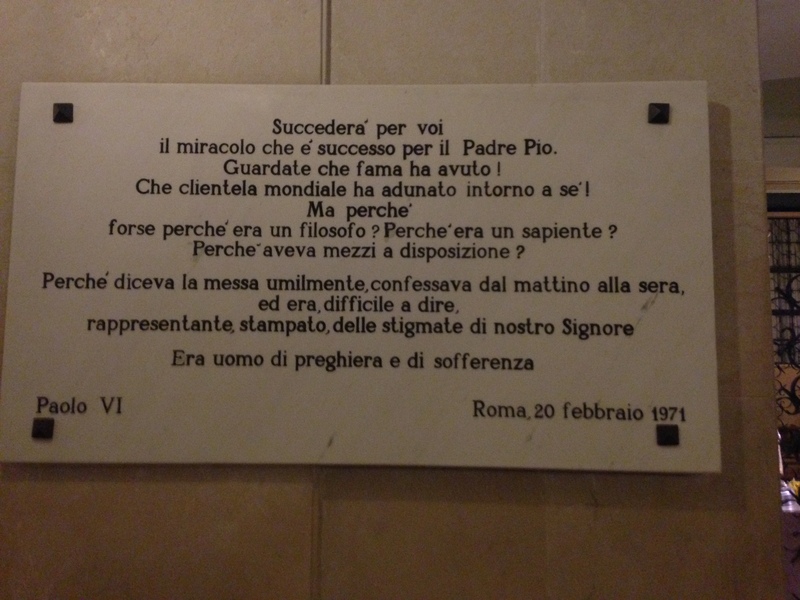 Seeing the tomb down in the catacombs, the letters he wrote, and the vast collection of Saint Pio’s relics was pretty astounding. 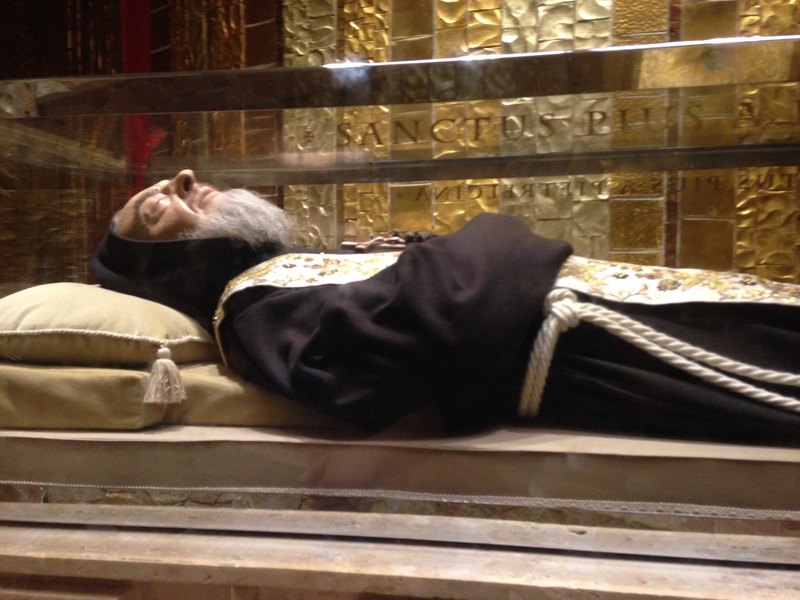 I wanted to find out more about this extraordinary man’s life, and what made Padre Pio the well-loved and respected saint he is both in Italian culture and all over the world. 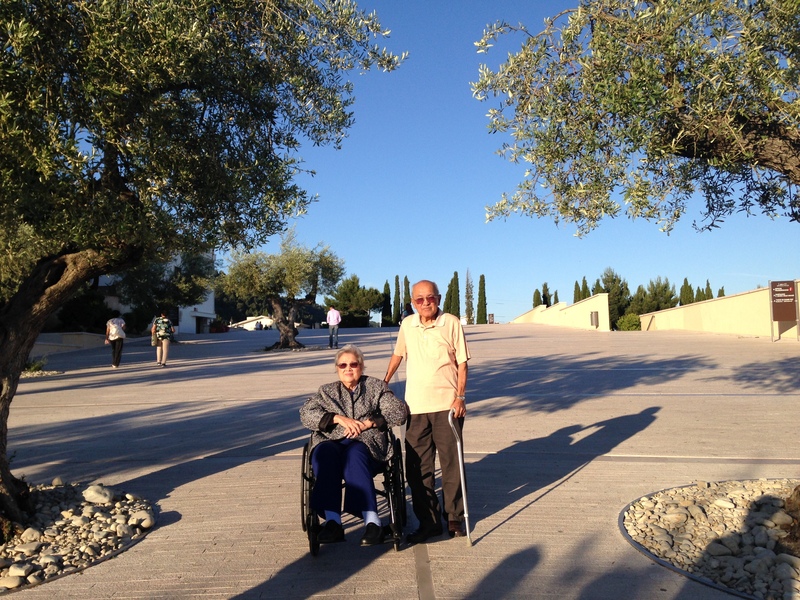 Inside the newly-built Basilica (Chiesa) San Pio di Pietrelcina. 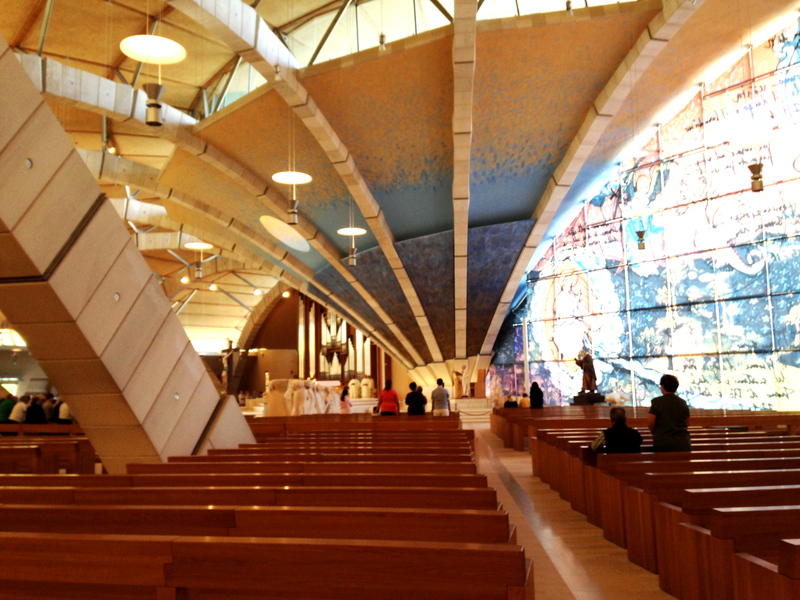 Reminded me so much of the Cathedral of Our Lady of Angels in LA! A book my friend Jerome lent me, Quiet Moments with Padre Pio by Patricia Treece, reads this: “It was this real person, not some laster saint, who wanted to join in Christ’s redemption of the world, understanding that there was a price to pay to wrest souls from darkness. ‘When I know that a person is afflicted, what would I not do to have the Lord relieve him of his sufferings! Willingly would I take upon myself all his afflictions in order to see him saved,’ Pio said and meant it, his heart burning with compassionate love for humanity. That love for others, of course, was the overflow, the spillage, of the love pouring into the saint from God, love to great he feared to burst trying to ‘contain it in the narrow cell of my heart’ ” (pg. 3). 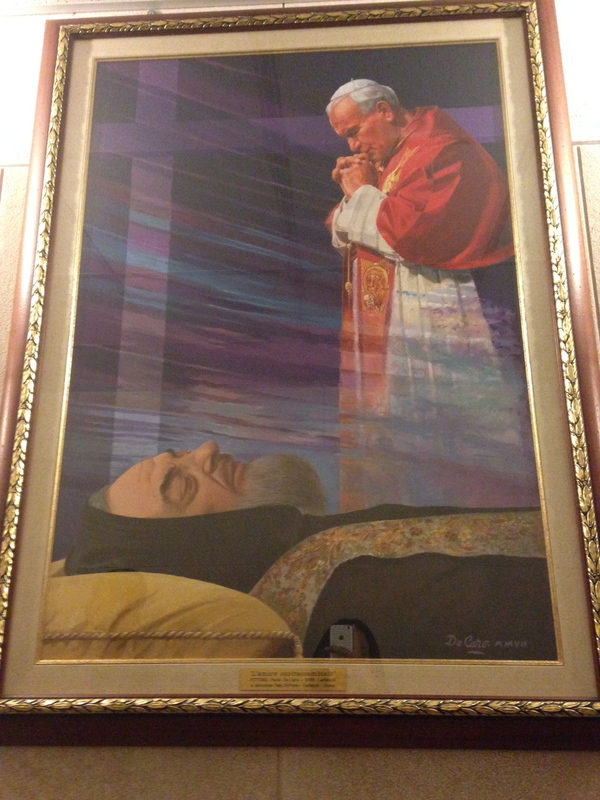 Padre Pio was an ordinary man who suffered and loved so much, much like Christ himself – who sacrificed Himself on the cross to save souls from redemption. He was called by God to reveal this mystic wonder, and to save souls. His main message to devoted Christians everywhere was to “pray, hope, and don’t worry,” to always have hope in Christ and the Virgin Mother Mary. (For more of Padre Pio’s simple, beautiful words of wisdom: check out this link.) He was always so thorough in his messages and confessions to others – no wonder people come from all over the world to pay homage to such a humble and devoted man. 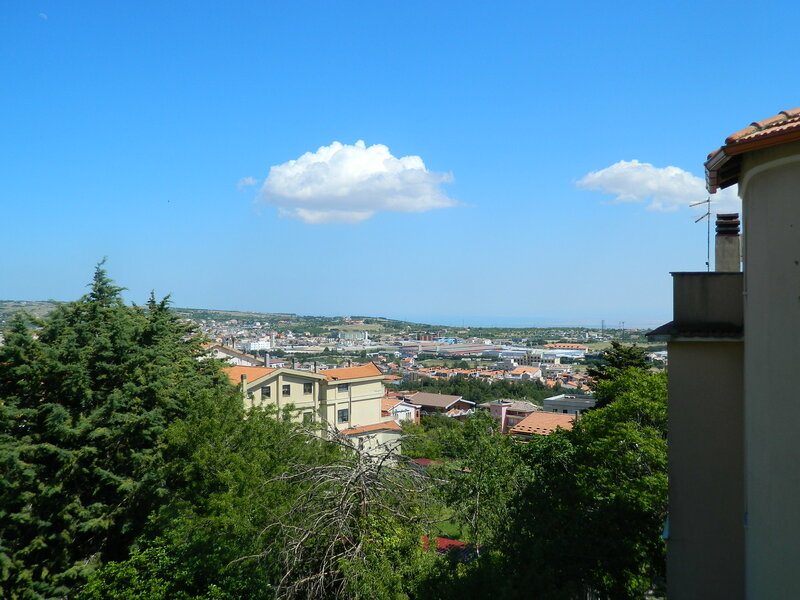 The next day, Saturday, was our busiest day in San Giovanni. 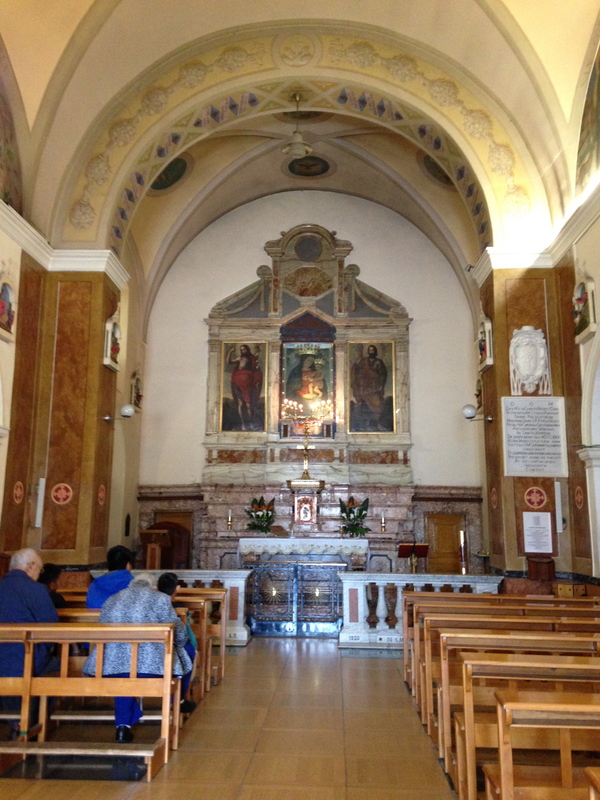 We had a hearty breakfast at the hotel, then walked up the hill to the old church, Our Lady of Grace, owned and operated by the Capuchin friars. We attended a 9:30 AM mass (in English this time, haha) led by one of the most adorable and wise priests I’ve ever met, Father Ermalindo. 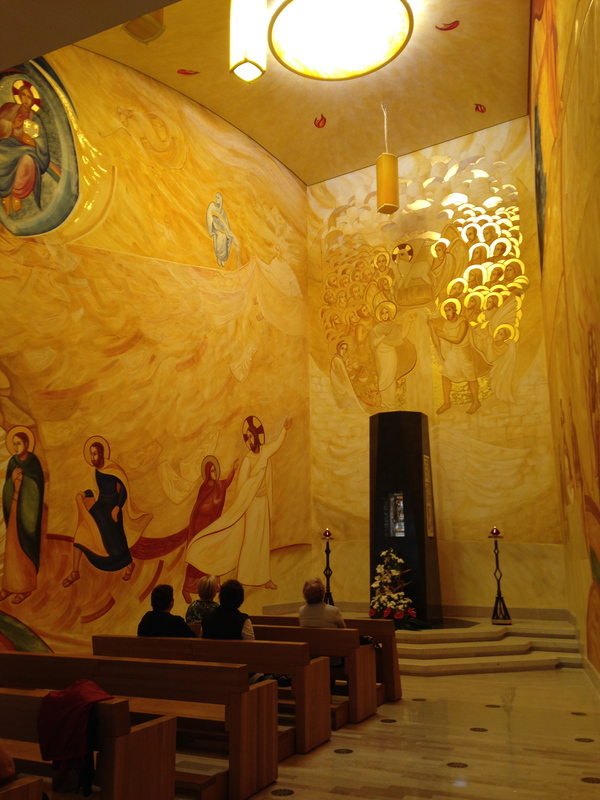 It was a small mass in the church with a simple, beautiful message of love and devotion to God. 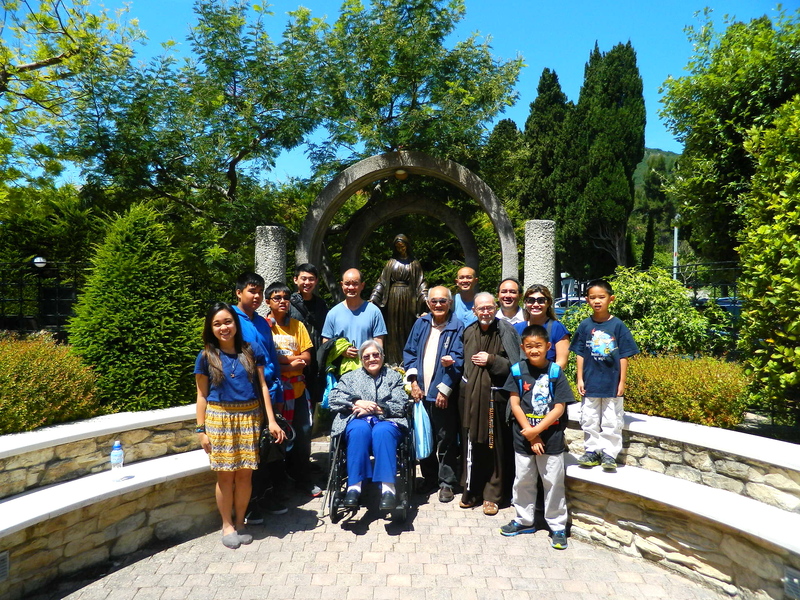 After the Mass, the whole group followed Fr. 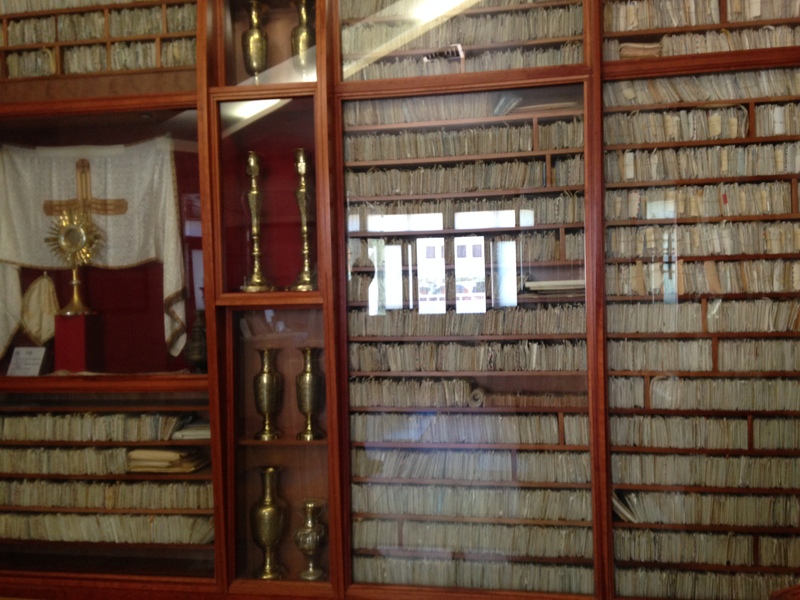 Ermalindo to the English office of the friary, where they introduced more of the brothers as well as gave us a great background on the life and story of Padre Pio. 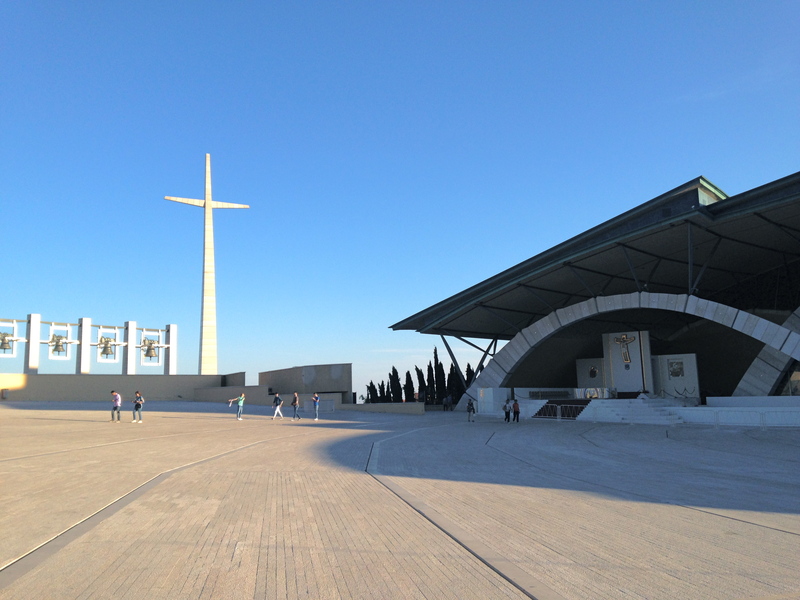 We watched two short films depicting what Padre was like in those 50 years he endured the stigmata, and also the way they exhumed his body in 2008, transferring it to a downstairs chapel in the new Basilica. 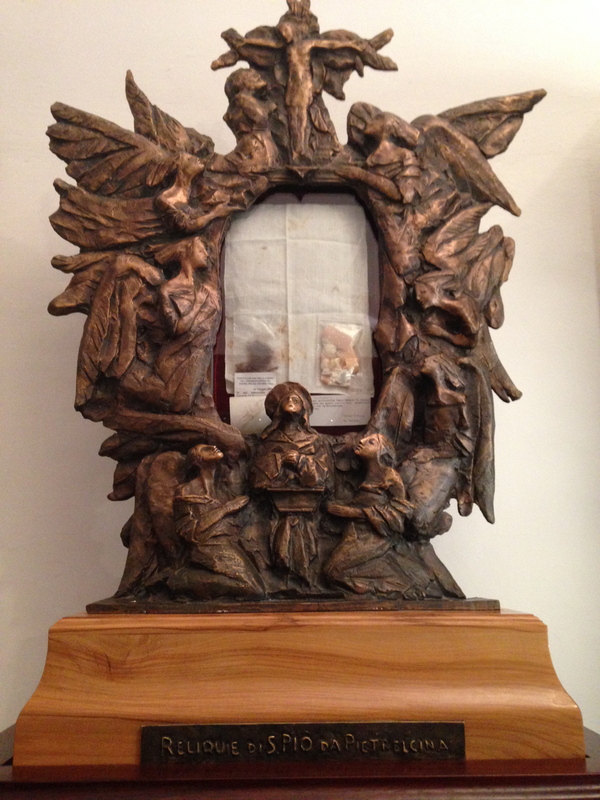 Father Ermalindo, who knew Padre Pio for a few years before his death, answered any questions we had and then blessed us all using second-class relics (gloves and napkins) that Padre Pio owned. 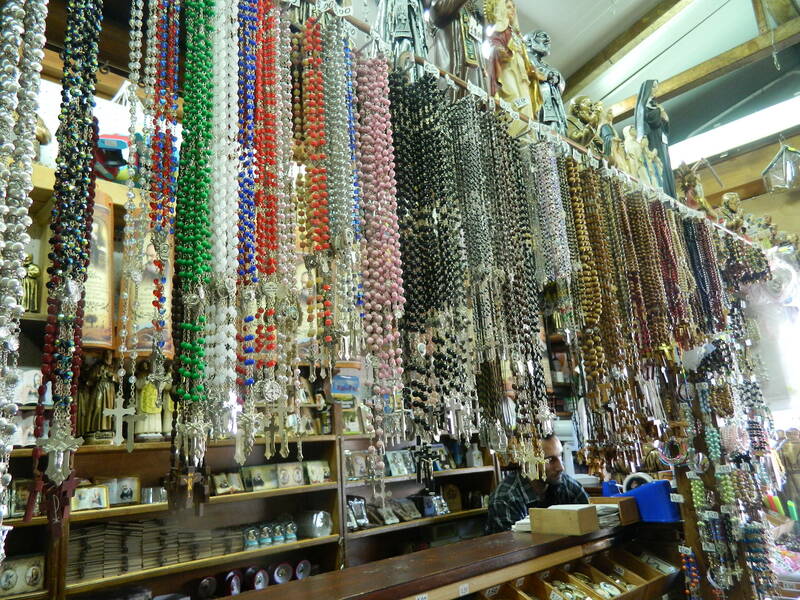 He placed the sacred objects on our foreheads and gave us each a blessing. During the video I wrote down a long list of intentions for my family, loved ones, and friends (yes, all of you Titas, aunts and uncles as well, all of whom I know are reading this!). 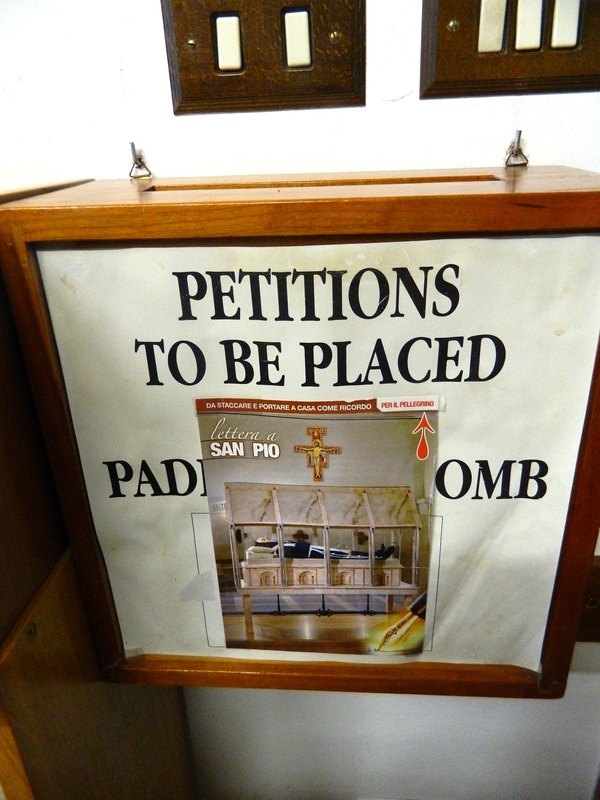 The list of intentions was put in a small box that will be taken the tomb of St. Pio by some of the friars and prayed over. Father Ermalindo saw me writing and asked, “Girl, are you writing a novel? !” He is so cute/hilarious haha. 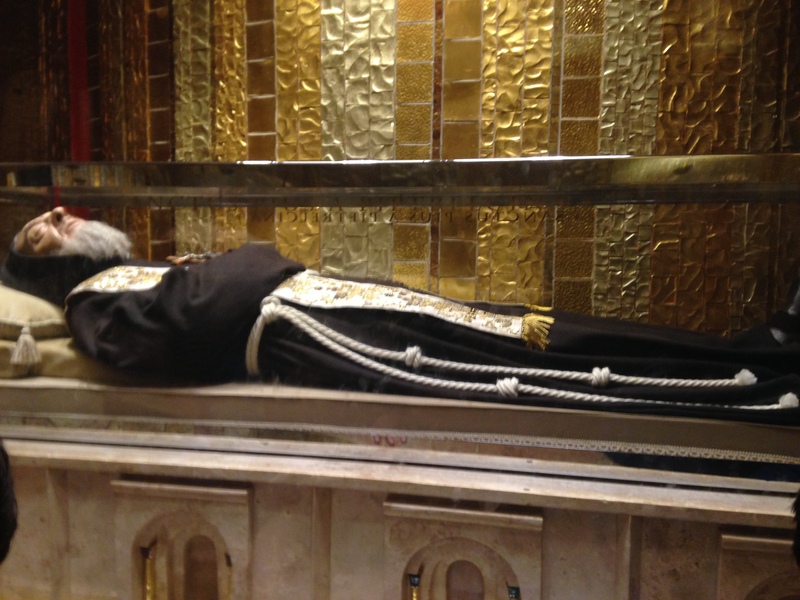 After chatting with Father for some time because my Lolo Pete and him have a mutual friend back home, we took a tour of the friary grounds and went down to the Basilica chapel to see the embalmed body. 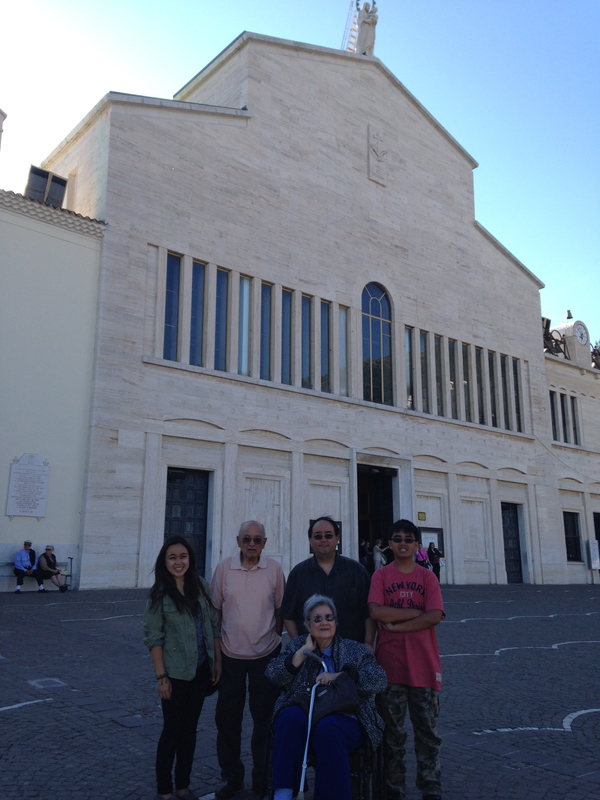 We had a really great American tour guide, who lives in San Giovanni and is really close to the Capuchin brothers. He told us about the grounds where Padre Pio liked to walk, where he often prayed, and which room he stayed at in the friary. 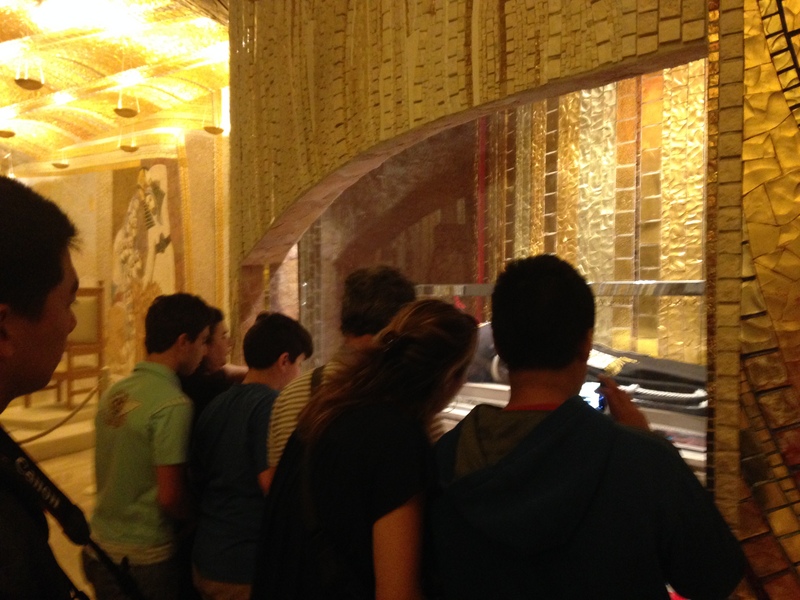 He took us down to the new chapel and down a magnificent hallway crowded with pilgrims, all waiting to see the sacred body that was removed from the tomb in 2008 and placed within the new basilica’s chapel. 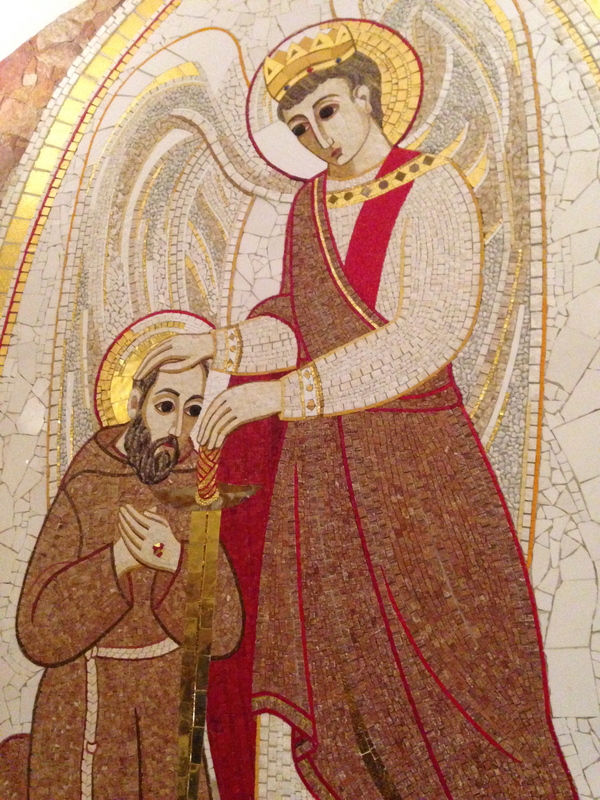 Along the walls were incredible mosaic art installations donated by different countries, including the Philippines, that each depicted scenes in Pio’s life which closely parallels the life of Saint Francis of Assisi. 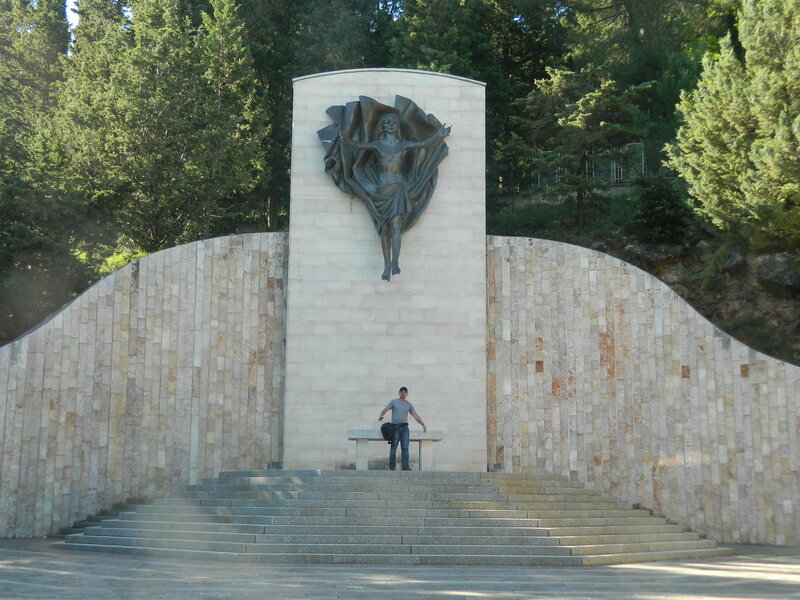 Walking through and looking at all of the pieces, I never realized how similar the two were in their devotion and faith. Though they each lived in very different times, both religious men were known for letting go of all they had, even comfort, and surrendering their lives wholly to God as priests in service to the Church. 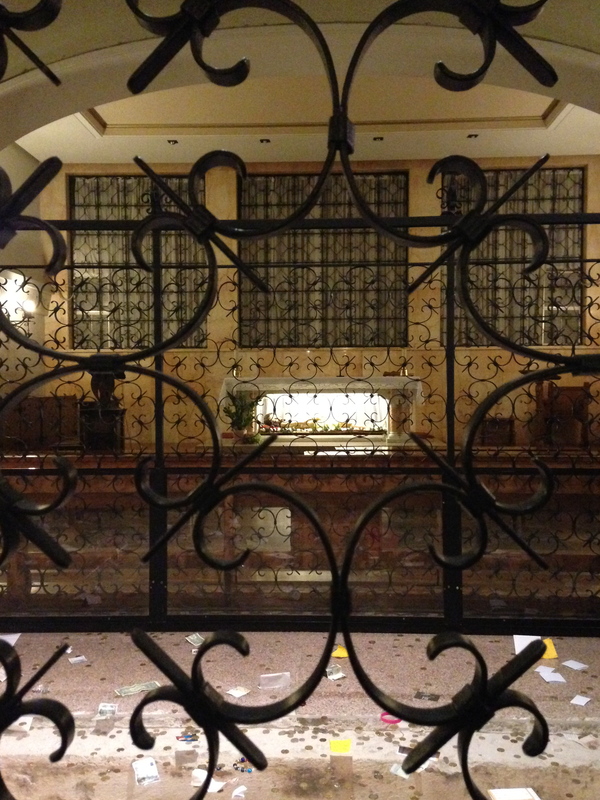 They both were a part of religious orders–St. 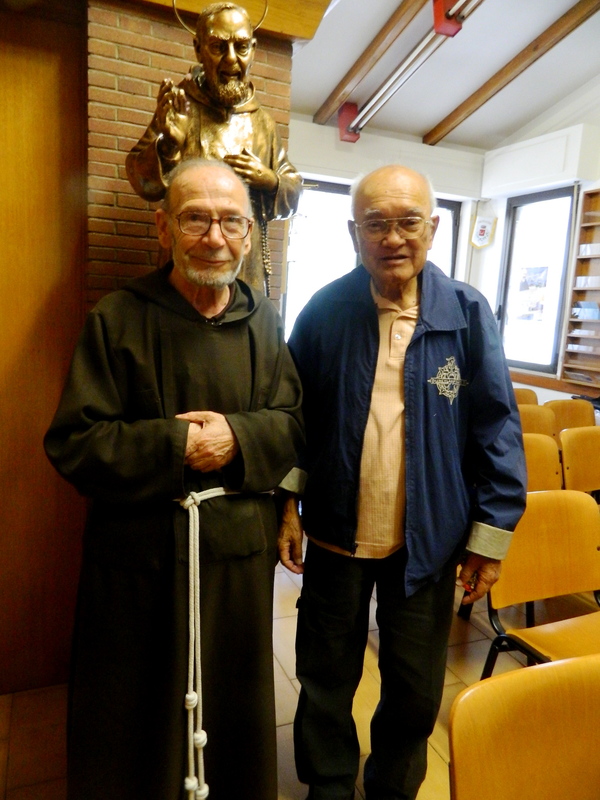 Francis founded the Franciscans, and Padre Pio was a part of the Capuchins, a side order within the Franciscans–and they both had simple, humble lives. But most of all, their love for the Lord is incredible. 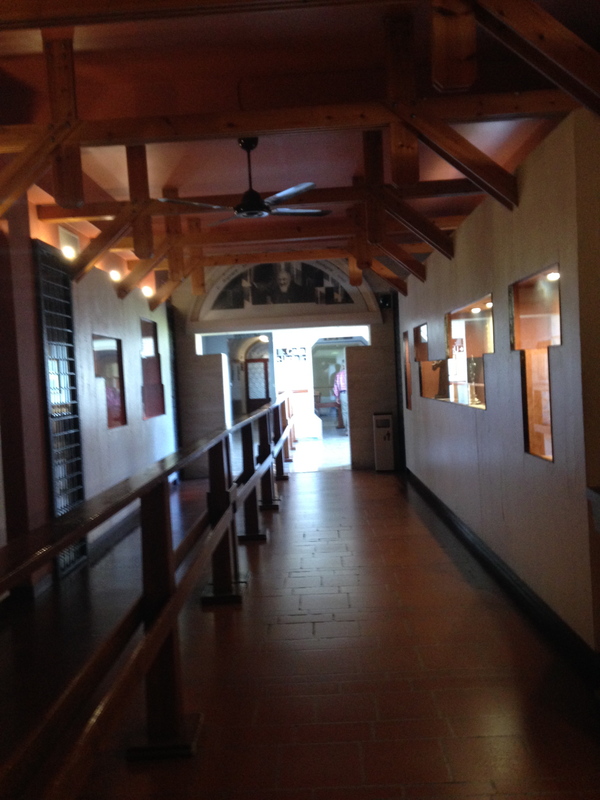 At last, we stepped out of the crowded hallway into the new chapel where the exhumed body is now laid to rest. 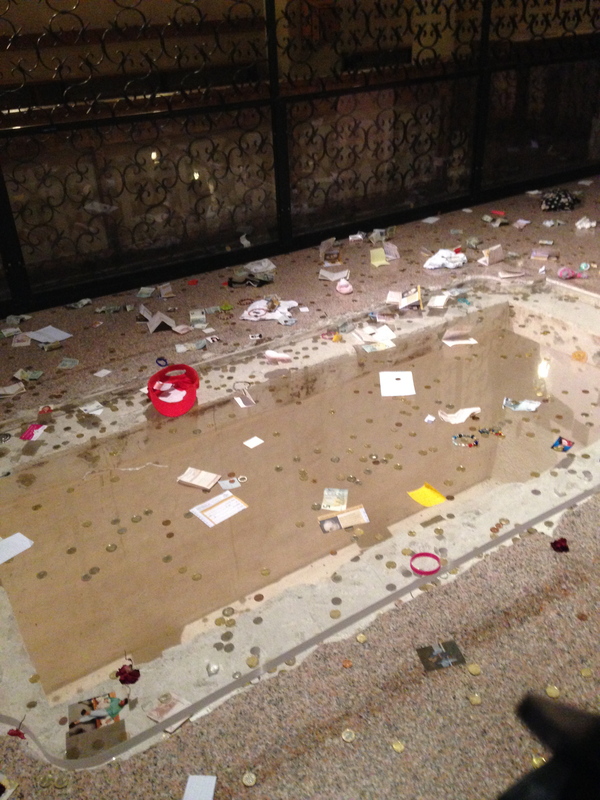 Luckily we beat the flocks of pilgrimage groups and made our way through a short line into the space behind the altar, to a glass panel containing the body of St. Padre Pio of Petrelcina. To be quite honest, I felt a little strange taking pictures of the embalmed body, like I couldn’t help but wonder if I would want my chemically-frozen lifeless body to be on display like that, for people to study and take pictures of. 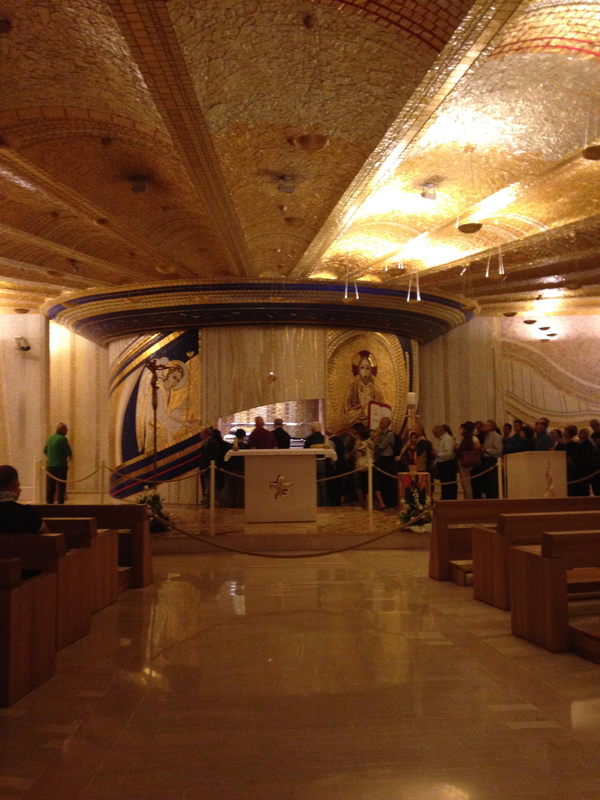 It almost felt… disrespectful, yet something in my heart told me St. Pio wouldn’t mind. 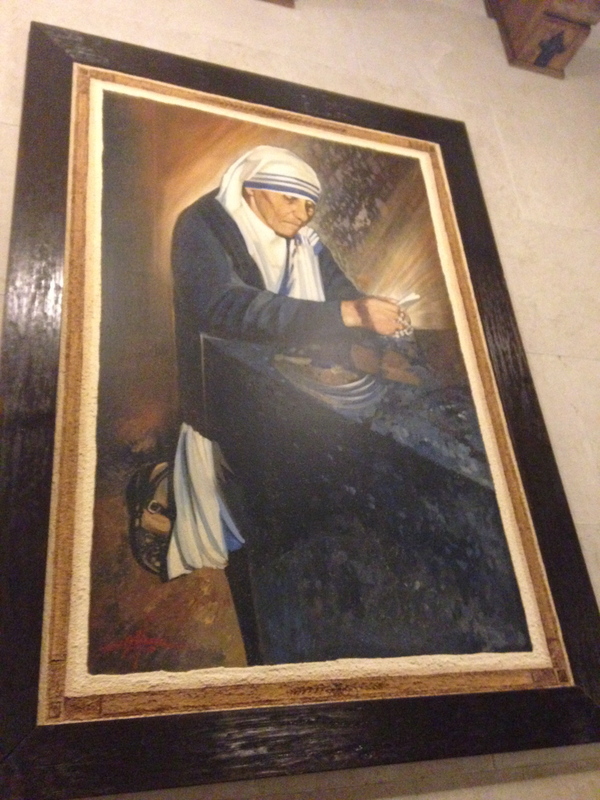 As long as I knelt down and said a quick prayer out of respect and admiration for this humble, holy man. 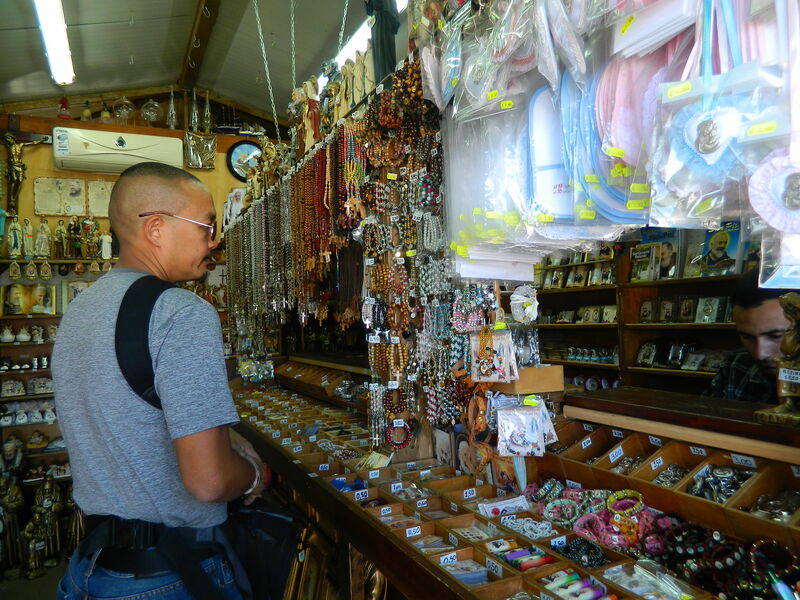 I touched the glass, looked into his face, and knelt down to whisper a quick prayer from my heart while surrounded by the growing crowd of pilgrims. 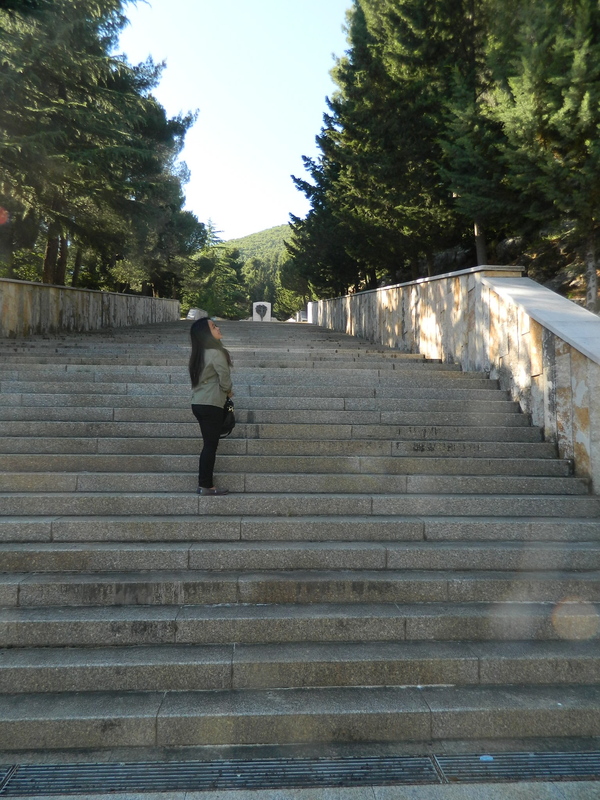 What was said will stay in my heart, but I felt a sudden rush of calm and gratitude after kneeling down, like I’d been talking with an old friend. 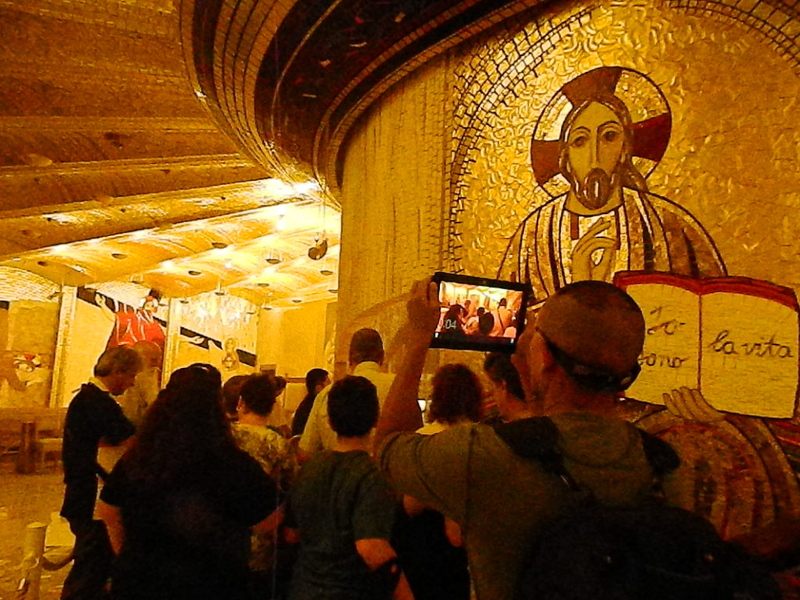 & somehow, amidst the throng of people, the flashing lights and the noise, Padre Pio was listening. 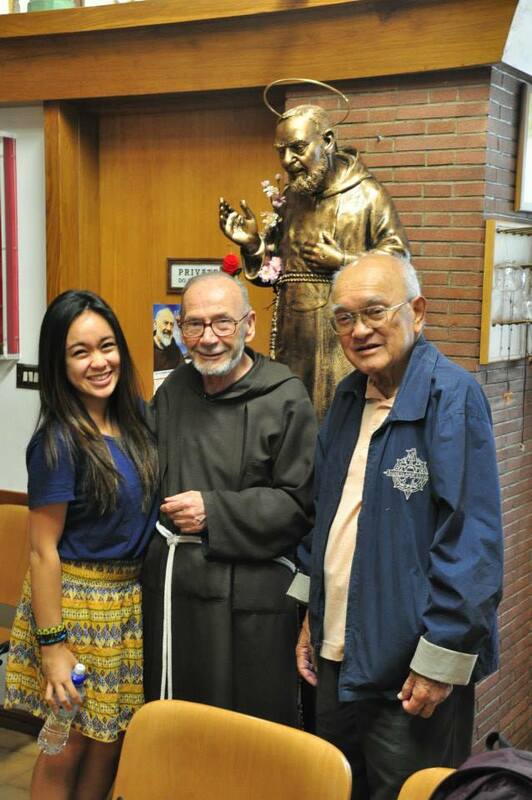 The humble lives of Padre Pio of Petrielcina, & Saint Francis of Assisi. 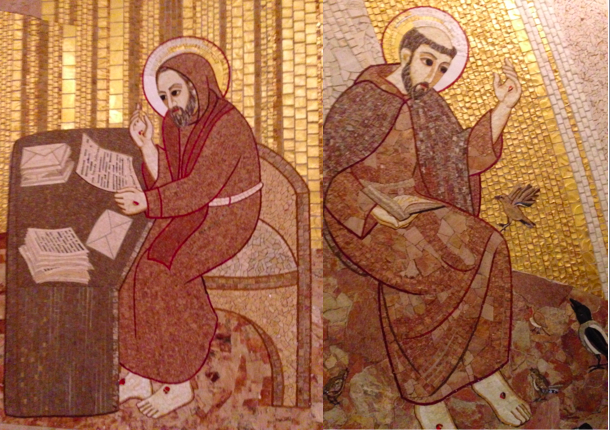 Both lived in simplicity and wisdom, Pio as a writer and spiritual director, and Francis in his respect for creation and recognition of God in all living things. The line got crazy long after we left! 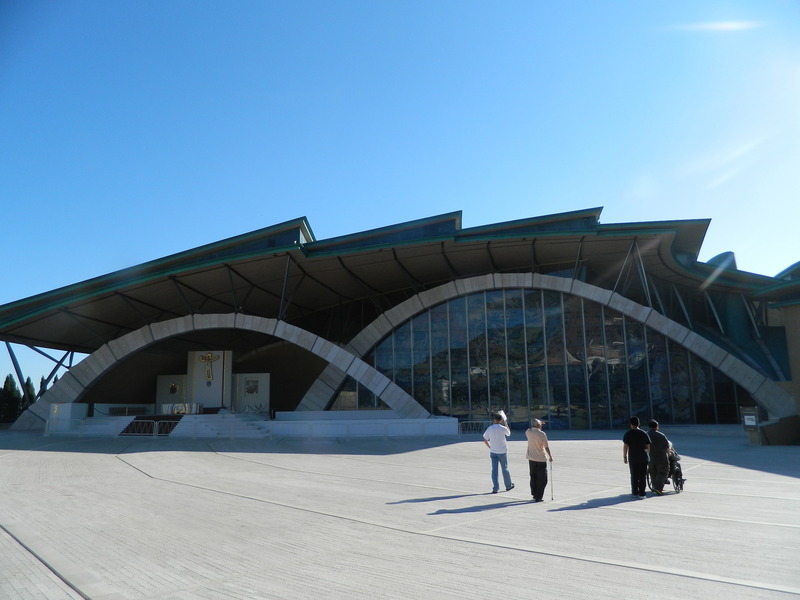 Overall, the 2-day pilgrimage in San Giovanni Rotondo, southern Italy, to Padre Pio’s church, museum, tomb and shrine has been a moving experience. Never would I have thought I’d have such a strong connection with such an ordinary, yet extraordinary, strong and courageous man. He felt pain and anguish but embraced it, never doubted, and he asked for so little. And he wrote all of it down! 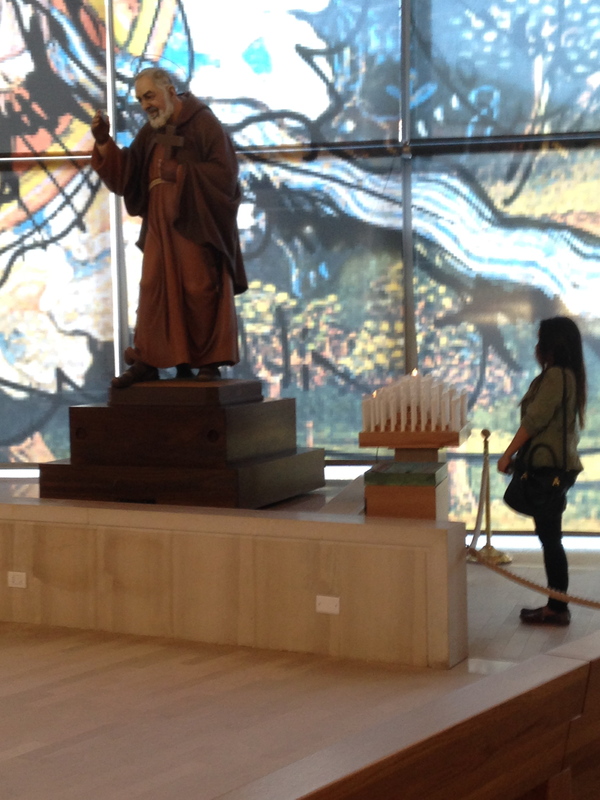 If you ask me, I could never imagine going through what he did, but I am so thankful that the world has/has had people like Saint Pio, who shine Christ’s light in the physical, tangible way people often need. He has been granted his heavenly reward. It’s cool to think that we knelt in the same pews & walked the same hallways as Pio and Saint Pope John Paul II and Mother Teresa. 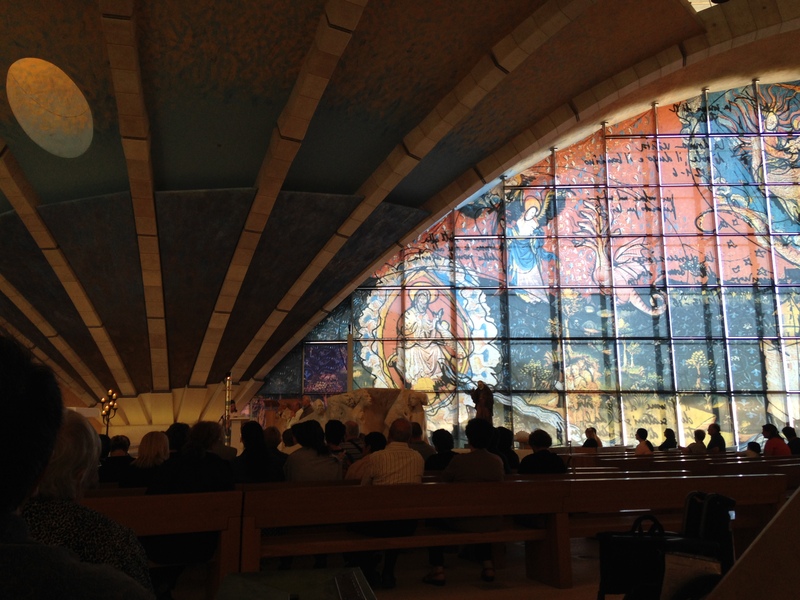 We prayed our intentions, worries, and gratitudes; heard the incredible stories, felt the emotions and expressed bewilderment at such a powerful and sacred presence. 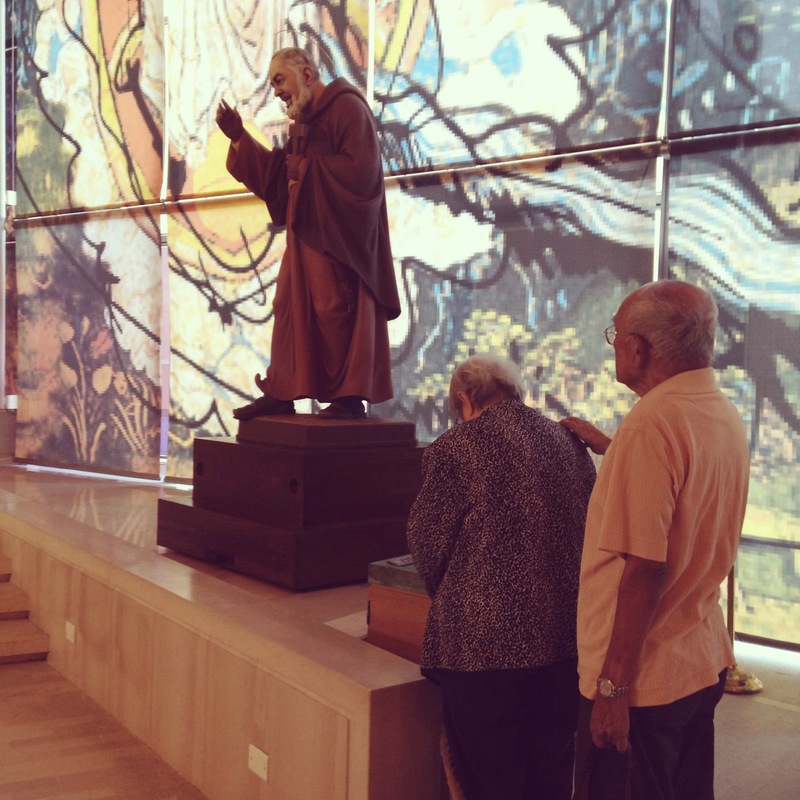 And of course, my Lolo Pete enjoyed the pilgrimage very much, as Padre Pio is one of his favorite saints; a listener, intercessor, and healer of souls.